The weekly calendar template is simple to use and practical to have around as a reliable way of keeping track of your daily and weekly events. When you look at the calendar at the top column to your left, there is a start date heading next to box where you input the date you want to begin recording your appointments or schedule. Below this column is the body of the calendar that is made up of rows and columns that display days of the week and the events in chronological order. Use the columns to input the time next to your appointment. That is all there is to using the calendar. 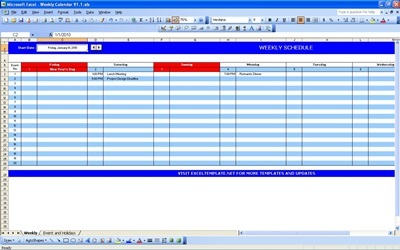 A great tool to have since the template is ready use the instant it is downloaded and there is really no learning curve to worry about when it comes to using the calendar because it is that simple. The calendar is for everyone since we all have stuff to do and having a weekly calendar to chart out what our “to-do-list” is will increase productivity by avoiding unnecessary running around. And we cannot expect to remember all that we have to do without sometimes forgetting. Having a weekly calendar will solve that problem. You will begin to feel more efficient when you are on top of things, especially when you are involved in planning a birthday party or some big event. And because the calendar exists on your computer, you can send a copy to anyone for approval or comment. Take the calendar with you on the go by printing out a copy to use as a reminder of all the stuff that you have to do for the day. This is a great cost-effective way of keeping track of your busy life without the hassle of using complicated software.